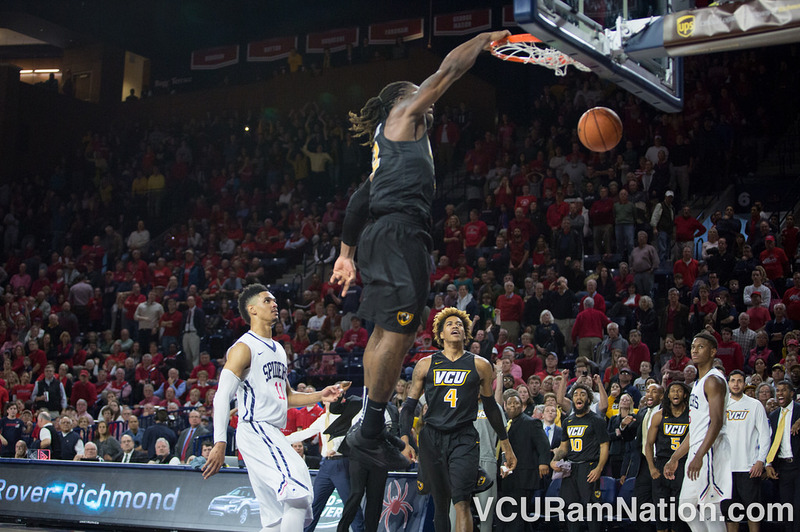 Mo Alie-Cox stole Richmond’s final inbound attempt, then hammered home a game-ending dunk to give VCU the 94-89 overtime win the last time these two faced at the Robins Center. The Rams will make the short ride across town for a Friday night battle with the Richmond Spiders. While all games between these two are must-wins, this one in particular has some very real implications. Both teams are looking to sure up a top-four seed and double bye in this year’s A-10 tournament, not to mention a potential outright regular season league title. A VCU win could almost certainly end Richmond’s shot at that while a Spiders win would pull Richmond within one game of the Rams in the overall conference standings. After a somewhat puzzling non-conference showing that included four close losses to top-100 teams, but also some poor showings against sub-200 teams, Richmond has been quite impressive in A-10 play. The Spiders own double-digit wins over three teams competing for a top-four seed (La Salle, Rhody and St. Bonaventure) and battled both VCU and Dayton before ultimately falling to the A-10 leaders on the road. Richmond’s two other losses have come to what has proven to be a poor matchup for Chris Mooney’s squad, dropping both games to 8-5 George Mason including a 23-point blowout this Tuesday. Star senior big, TJ Cline, played just 26 minutes in that loss but still managed to put 21 points on the board. The Niagara transfer has been sensational for the Spiders all season long, posting a ridiculous 19.3-point, 8.3-rebound, 5.4-assist season line. He was held to “just” 15 points in VCU’s early season win over the Spiders. Cline is joined by underrated senior starter, ShawnDre’ Jones, a 6′ guard who dumped 30 on the Rams on Feb 1. Despite being a poor rebounding team, the Spiders somehow managed to out-rebound VCU in their last meeting, but failed to defend VCU very well inside the arc and were outscored 24-12 at the free throw stripe. Richmond is incredibly good at finishing inside the arc, getting free for easy buckets thanks to an offense that is constantly in motion. Richmond is finishing 55.4% of their two-point buckets, finished 57.9% of those against VCU in their last contest and are likely to attempt more of the same on Friday night after watching a poor SJU offense gash VCU for 48 points inside the arc earlier this week. The Spiders have won five of their six A-10 home contests with relative ease, dropping their only A-10 home game to Mason in a game the Patriots killed them on the boards (by 11) and held UofR to just 40% shooting inside the arc. That’ll be the goal of VCU on Friday. “Fool’s gold” was how Will Wade described VCU’s recent home win against Saint Joseph’s, suggesting the Rams would get “annihilated” by Richmond if they played that same way on Friday. I agree with that assessment. VCU hasn’t really looked all that impressive since blowing out La Salle on Jan 22 (although the Davidson win was solid), BUT…they’ve won. The Rams are riding a seven-game winning streak that included two 0.4 miracles and five home wins. With a brutal five-game closing slate that includes road contests at top-four teams Richmond, Dayton then Rhode Island, VCU will need to step their game up to have any shot at an A-10 regular season title and will need improved play to assure both an NCAA at-large worthy resume and top-four seed in this year’s A-10 tournament. The good news is VCU has flashed all the key elements needed to be a very dangerous team. The trick will be doing multiple of those in the same game against a good opponent. VCU hit 48% of their threes against SJU but played poor defense in the win. The Rams couldn’t throw the ball in the ocean at GW but held the Colonials to just 53 points. It’s been an either this in several of VCU’s A-10 contests. The pieces are there, but going forward it will be a matter of playing a more complete game. It will have to be. The leadership poster version of “VCU WINS IF” in this one is if they “come out with a laser-sharp focus”. Usually I’m not a big motivational coaching fan, I’m more of an X’s and O’s lover. I love Shaka Smart, but the deference in my opinion between Smart and Wade is Smart is that motivational type while Wade is more of the chess player. Oddly enough in this one I think we need more than just the chess coach, we need the chess coach AND we need our guys playing like their lives depend on it. Friday’s game at Richmond can do so much for the post-season aspirations of this season’s team, meaning they need to follow the plan while fighting on every single play. Like Will Wade said, if they aren’t, they could get annihilated. But if they do, they could be the ones handing out the annihilation. I’ll be real, a VCU at Richmond game is as electric of an environment as I’ve seen in college hoops (and I cover all the games at VCU and have been to Cameron Indoor as well). The Robins Center can be a morgue outside of that matchup, but when these two city rivalries meet it always feels like a championship game and since it’s become an A-10 rivalry, it’s always been full of drama. Three of the four VCU v Richmond Robins Center A-10 contests have come down to overtime, the other, a VCU win, was a 56-50 RVA rock fight. In order to make this a drama-free affair the Spiders must first keep VCU from scoring the easy buckets. The Rams shot over 50% inside the arc in only one of their five losses this season (to Baylor, the nation’s current No.4 team). VCU has struggled most this season when teams are able to keep them from doing what they want to do: attacking the basket. Being an undersized team that can’t afford foul trouble to TJ Cline, that becomes a little more difficult, but it remains key and likely must be done for the Spiders to win. On the other end it’s a matter of making shots. Richmond hit 57.9% inside the arc against VCU early this season but shot just 31.6% from deep in the loss. When the deep ball falls for the Spiders they are a completely different team, one that can beat anyone in this conference and potentially win the A-10 tournament. In order to do that they’ll need at least three good nights in March, but in order to beat VCU on Friday, it just takes one good night from deep. Kenpom: 74-71 VCU win with an 59% chance of a Rams victory. Watch: ESPN2, Official game day headquarters are Baja Bean Co. in the Fan and Buffalo Wild Wings locations at Virginia Center and downtown on Cary Street in Shockoe Bottom.